Yes indeed, our Christ knows and well understands about these matters. By praying to Mother for that persons further enlightenment through the revelation of our King Christ, you can know that nothing escapes his notice. All things occurring in this world are an open book to him. He reads everything – including minds and all that is spoken. His understanding and revelation must come into play for further enlightenment. You are cautioned not to argue with anyone about your belief or the vital message you impart. You receive your heavenly nourishment in the privacy of your homes. You have not hounded him so as to further his footsteps off of the path to Salvation and thus bringing him under law and judgment. So, who promises to set all matters straight when he arrives to lift the veil? You’re doing your job, and you can not do everything, so he too has a job to do. He must be the one that sets all matters straight. Humans are imperfect, in not comprehending the full truth of all matters. But that does not destined anyone to eternal destruction, unless they LOVE a lie and will not accept the truth from the one that helped to establish it on its foundation of the Perfect Rock – Yahweh. So by your teaching him, you have done your job as a faithful steward. 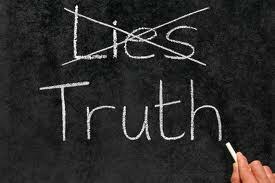 It is not those that mistakenly believe in a deception, but those that are untaught in the Word and those that are unstable that willfully twist the truth into lies that are marked for destruction. If you willingly permit your ear to be tickled after learning the truth and want no part of it, then you would also be destined for destruction by following that path of the twisted faith. So those that desire a tickling are wanting a different reality and not the one promised. They seldom move off the wide spacious path even when Christ gives the message. We know that to be true from the days he was on earth. People will shout with joy at the fall of this old wicked system of things. it will have perished at the completion of the 7th Trumpet’s sound. Each person will advance because the veil had been removed and the evil done away with. The path will then be firmly straight for all to follow. This is because all matters will be set straight by our reigning King Christ Jesus. How will he do this? Not Mount Zion proper, but sustains you by Alpha Command’s efforts. However, the Sanctuary is atop Mount Zion, so the effort is unified because Christ is the Helper and comes forth with his spirit from the Sanctuary. He gives spiritual help while Alpha Command gives physical help to sustain our existence in creation. Zion is where Alpha Command administers Yahweh’s Authority from. She will not let it perish from attack by any enemy. She has proved that in the past. Judah, that is where the Holy Ghost Consortium congregates in Heaven, it is made up of cities of holy ghost spirits in service to Christ and our glorious Mother We are promised that we will always possess Judah. Like the symbolic 144,000 Holy Ghost that actually represent far more thousands upon thousand than merely 144,000, because that is the number of Orders of Holy Ghosts. And Judah spoken of singularly is really a complex of cities in a strategic region of Heaven assigned to the Orders of Holy Ghosts. We took a solemn Oath to serve our Mother faithfully and with endurance to see the spiritual war to the end. This is because your own understanding is not trustworthy. This tells you there is more than one path that leads you to Christ’s path. But you can walk the other if you are led because you are one foot on the narrow path with the other on a path that leads you off the wide spacious path. To be fully on the narrow path one would have to be perfected to the point of Christ. But that will come for all of us as time moves on. We are all just children in the faith of the One that can redeem us from this Satanic nightmare. This entry was posted in Chris's Kingdom, Christ Jesus, Christian Conduct, Falsehoods, Holy Scriptures, Ministering, Truth, Yahweh and tagged Christ Jesus, Christ's Path, Falsehoods, Ministering Truth, Myths, Truth. Bookmark the permalink.